If thirteen years ago, when I first picked up a copy of Ultimate Spider-Man, someone had told me that one day Peter Parker was going to die, be replaced, and that I was going to love it, I would have called them absolutely insane. Ultimate Spider-Man was the book that brought me back into comic shops and turned me into a Wednesday regular. I loved seeing Peter's adventures as Spider-Man re-imagined for a 21st Century world, I couldn't even fathom something like Peter dying. Yet two years ago that's exactly what happened. Peter Parker was killed in a final showdown with the Sinister Six and boom, we got ourselves a new Spider-Man for a new era. His name is Miles Morales. He's an incredibly written and drawn character, but he is also, without a doubt, the most important, ongoing character in super hero comics today. It has been a blast these past two years to follow Miles and his adventures as Spider-Man. Writer and creator Brian Michael Bendis is my favorite author, and seeing him work his magic to turn the Spider-Man mythos on its head has been truly exhilarating. I've loved Miles from the get-go, yet only recently did it really hit me how truly important Miles is and the real impact his character is having. Reading constantly positive fan responses in the letter column really opened my eyes, like these two. I am new when it comes to reading comic books. Ever since the late 90's and the early 00's I've watched animated TV shows based on heroes like Spider-Man. I rarely picked up a comic book until I started reading about Miles Morales the new Spider-Man. When I saw and heard about an Afro-Hispanic becoming the new Spider-Man, I couldn't believe it: A hero with the same skin color and a last name almost identical to mine. When Ultimate Spider-Man came out [in 2000], we read the books together sometimes. I have to thank you guys at Marvel for that experience, but she died before I could tell her that a new, young, black Spider-Man was created. She never got to meet Miles Morales. It's my belief that she, being half black and Native American herself, would LOVE him. I know it's kind of dumb, but I regret that I couldn't enjoy these new stories with her. I'm mixed-race myself, and, while watching the reactions to Ultimate Spiderman, it occurred to me that there is a severe lack of mixed race and minority characters in the forefront of not just comics, but in almost every form of media. Sure, mixed race and minority characters exist, but lets face it, how many of them are as important to pop-culture as Spider-Man? I challenge you to take a walk down any aisle of a book store, comic store, or movie store and tell me how many covers of these media prominently feature a minority or mixed race character. The really sad answer, as many of you will tell me, is not many. The criminal lack of variety in mainstream protagonists is a real problem, it cuts out entire groups of people who have every right to imagine themselves in the hero role. So, seeing, not just a minority character, but a mixed-race character take on a a role as big and important as Spider-Man? It's amazing, spectacular even. No matter what comic book adjectives you use to describe it, seeing Miles as Spider-Man is awesome in every conceivable way. Reactions like this one are just why characters just like Miles need be in to the forefront of again, not just comics but all media. Opinions like this do not go away if we just sit back and do nothing. They change when we create more character like Miles not only for those of us who identify with mixed-race or minority characters but for those who don't, who could maybe learn not to be prejudiced by admiring a hero that looks nothing like them. Now I'd love to say that creating more and more minority and mixed-race characters would eliminate prejudice entirely, but sadly it won't. However, if kids of all races grow up and see things like a mixed-race Spider-Man or a black Nick Fury in their comics and on their TVs, it will definitely help combat prejudice. It will help all kids to see that the true definition of characters is made through actions and not what color they are. Anyone can be a hero. Anyone can be the every-man. So, dear Miles Morales, I salute thee for breaking the color barrier; for avoiding racial stereotypes; for not being just another comic PR stunt; but most of all, for living up to the namesake of Spider-Man and showing that your existence is as vital to pop culture as breathing. If anyone wants to read about Miles and his adventures I highly recommend all four collected editions of Ultimate Comics Spider-Man, which you can read without having read any of the other Ultimate Spider-Man material. There is also a wonderful crossover of him meeting main Marvel Universe Spidey called Spider-Men. And I'll leave you with some additional Miles awesomeness: Here is a fan film by RobotUnderDog. Enjoy! I have yet to read most of the Miles Ultimate Spider-Man stuff (still working my way through Peter Parker's adventures), but I did read Spider-Men, which was absolutely one of the best miniseries of last year. In just five short issues I was head-over-heels in love with this kid. He is incredible. 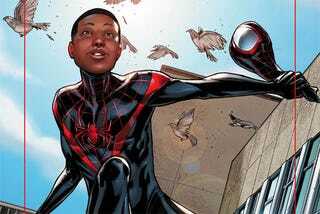 So, if you haven't checked out Miles Morales, please do. I know you won't be disappointed. Most of the art in this post is done by the amazing, spectacular, ultimate Sara Pichelli.